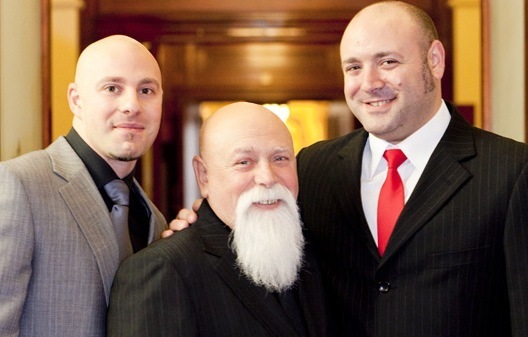 2012 – Romeo Biancofiore | Father's Day Council of Victoria Inc. The Father’s Day Council of Victoria today (Monday 27 August, 11.30am) announced 59 year old Italian immigrant Romeo Biancofiore, of St Albans, as Victoria’s 2012 Father of the Year. “In most kids’ lives their hero is usually a sports star, Hollywood actor or some sort of celebrity. But mine has always been my dad,” says his youngest of two sons, Rob, 27. Like so many of the 2,000 nominees, Romeo shone most strongly in the eyes of those who care about them most – their children. Romeo single-handedly raised Rob and his brother Anthony after his wife’s death 15 years ago, and remains actively involved in their lives as adults, as well as helping care for his elderly parents. He’s a traditional hard-working Australian dad turned primary parent and carer, with the close relationship he enjoys with his adult sons forged in those tough years of adversity. Migrating to Australia with his Italian family when he was six and with limited English, Romeo struggled through school, joined the workforce at 12, and married another Italian immigrant, Nella, in his early 20s, after spending three years in the Australian Army. Like many traditional families of the time, Romeo worked two, sometimes three jobs to support with wife and children – and Rob with his wife Belinda is currently doing much the same to get ahead and pay off their home in Caroline Springs. Anthony, 31, is likewise a hard worker, managing business systems and data at a major metropolitan hospital. As a result of the long hours and hard work Romeo has arthritis in both knees and endured several operations, the last of which caused a minor heart attack. Romeo remains a committed carer, spending his day visiting his wife at the cemetery before going to his parents’ house where he provides much needed respite for his sisters, who care for his mum and dad who both suffer from dementia. “He is reliable, a man of his word, he never lets anyone down. Just an all-round good person with morals and generosity. Someone to look up to, mould your life around. A heart of gold and a smile of warmth, My Hero,” wrote Rob in his heartfelt nomination of his dad. “Every kid deserves a dad like this, I’m just over the moon he’s mine”. Since 1956, the Father’s Day Council of Victoria has named a Father of the Year for Victoria, to celebrate and recognise the important role fathers and father-figures play in family life and in the past eight years the YMCA has partnered the Council and co-ordinated the Local Community Father of the Year in every region where there is a YMCA. The Father’s Day Council of Victoria considers all Local YMCA Community Father of the Year recipients when selecting the Victorian Father of the Year as well as nominations directly submitted to the Council. “There were over 2000 amazing nominations this year, and we congratulate every single nominee for their continued dedication and enrichment of their children’s lives,” said Mr Parsons.